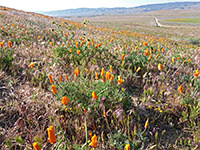 The California poppy, eschscholzia californica, is found over a wide area of the western US, from the three Pacific states, across the southern deserts into New Mexico and far West Texas, but is most common, and numerous, along the western edge of the Mojave Desert in California, at elevations in the range 2,000 to 3,000 feet. 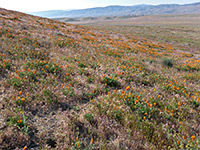 One small part of this region, a group of low, treeless hills where the plant grows especially densely, is protected as the Antelope Valley California Poppy Reserve, a state natural reserve; a very popular place in the spring when the poppies are in bloom, which is usually sometime between late February and early May, though understandably relatively empty at other times of the year since there are no natural features of note and hence not much see once the poppies and other wildflowers have withered. 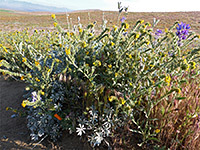 The date and duration of flowering is dependent on the timing and intensity of winter rainfall. The preserve is 2 by 2 miles in size, and contains about half of the Antelope Buttes, rolling hills rising at most 400 feet above the surroundings, within sight of a slightly larger, more steep-sided hill (Fairmont Butte) to the northwest, and four miles from the edge of the mountains of the Los Padres National Forest, which form an obvious boundary to the Mojave Desert plains below. The park has a small visitor center and is crossed by 8 miles of intersecting trails, visiting three minor summits and crossing the broad valleys in between. 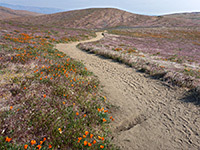 All paths are similar, and a walk of just a couple of miles is enough for a full appreciation of the scenery, and a chance of seeing most of the common wildflowers, with another dozen or so species quite widespread, in addition to the poppies. The reserve is reached from Lancaster in the east by Avenue I, a straight road passing steadily less-developed surroundings, eventually entering slightly hilly terrain, and curving round a few bends to the entrance. The road, now known as Lancaster Road, continues 12 miles west to an intersection with Hwy 138, which meets Interstate 5, 14 miles further. 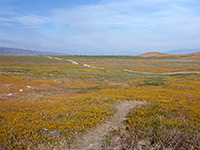 The entrance fee for the reserve is $10 per vehicle (2019), perhaps relatively expensive compared with some other places that have more varied scenery, though pedestrian access is free and cars are allowed to park along the main road once 100 feet away from the turning; from here the visitor center is reached by a half mile walk. The road verges are also used if the official parking area is full up, a common occurrence on weekends at the peak flowering season. 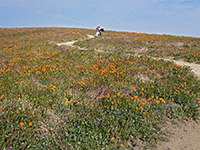 Other fields and hills all around the reserve have equally fine displays of the poppies, though much of this land is privately owned. Off-trail walking is not permitted in the reserve, in order to prevent plant damage, and even walking just a few feet away from the path is discouraged, so most of the area is not accessible, since the trails only access the central third, across the high ground of the Antelope Buttes. All routes are easy, with gentle grades, and have similar views, of flat farmland in all directions, and south towards the high mountains. 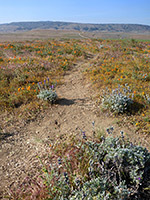 The shortest of the main loops are the 2 mile Poppy Trail to the west, with an optional shortcut across Tehachapi Vista at the center, and the 1.7 Antelope Loop to the east. The longest loop (Antelope Butte/Lightning Bolt) is 3.5 miles. The hills are liable to be windy due to the exposed location at the foot of the mountains, and the lack of any nearby higher ground, while the grasslands apparently have a high incidence of Mojave green rattlesnakes.